to measure the beauty, craftsmanship and value of a diamond. The measurement of how much a diamond weighs. A metric ‘carat’ is defined as 200 milligrams. Each carat can be subdivided into 100 ‘points’. This allows very precise measurements to the hundredth decimal place. The weight of a diamond below one carat can also be described by its ‘points’ alone. For instance, a diamond that weighs 0.25 carats could also be referred to as a ‘twenty-five pointer’. Diamond weights greater than one carat are expressed in carats and decimals. A 1.08 carat stone would be described as ‘one point oh eight carats’. All else being equal, diamond price increases with carat weight, because larger diamonds are more rare and more desirable. But two diamonds of equal carat weight can have very different values (and prices) depending on three other factors within the 4Cs: clarity, color and cut. 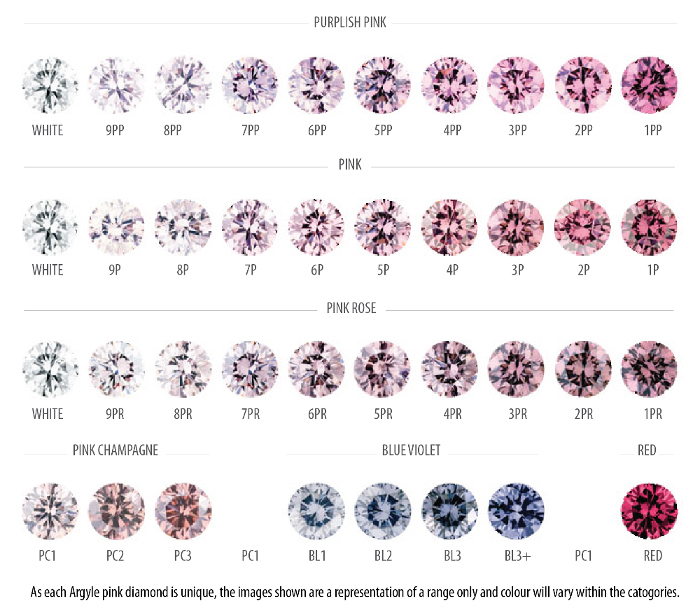 The color evaluation of most gem-quality diamonds is based on the absence of color. A chemically pure and structurally perfect diamond has no hue, and consequently, a higher value. The Color Grading System measures the degree of colorlessness by comparing a stone, under controlled lighting and precise viewing conditions, to masterstones of established color value. Many of these color distrinctions are so subtle that they are invisible to the untrained eye; however, these distinctions make a very big difference in diamond quality and price. The Color Grading Scale is the industry’s most widely accepted grading system. HUE is the domainant colour of the diamond. Sometimes there are modifying colours of tints that affect hue. For example, a diamond with a pink hue may have a purplish tint. SATURATION is the strength or purity of the hue. Hue saturation in pink diamonds can range from light pink to intense, and at the strongest saturation, vivid. TONE is the amount of lightness or darkness in the diamond. The range of tone extends from light to dark. Natural diamonds are the result of carbon exposed to tremendous heat and pressure deep in the earth. This process can result in a variety of internal characteristics called ‘inclusions’ and external characteristics called ‘blemishes’. 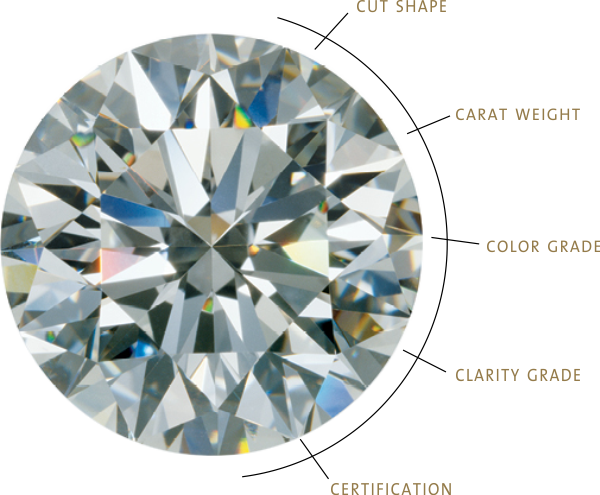 Evaluating diamond clarity involves determining the number, size, relief, nature and position of these characteristics, as well as how these affect the overall appearance of the stone. While no diamond is perfectly pure, the closer it comes, the higher its value. The value of a precious stone is determined by its gemological makeup, natural rarity and finished quality. Diamonds and gemstones of similar appearance can have important differences in value. Even experts need powerful analytic tools to detect synthetics, treatments and enhancement processes. A Certificate clearly discloses the details of any item it accompanies, providing confidence for both buyer and seller. Gemstones should only change hands when accompanied by a certificate attesting to quality. Regardless of location or marketplace, an authentic Laboratory Report is the common language of trust and confidence in the gemological world, and should be considered an essential part of any transaction. We take this responsibility very seriously. Diamonds are renowned for their ability to transmit light and sparkle so intensely. 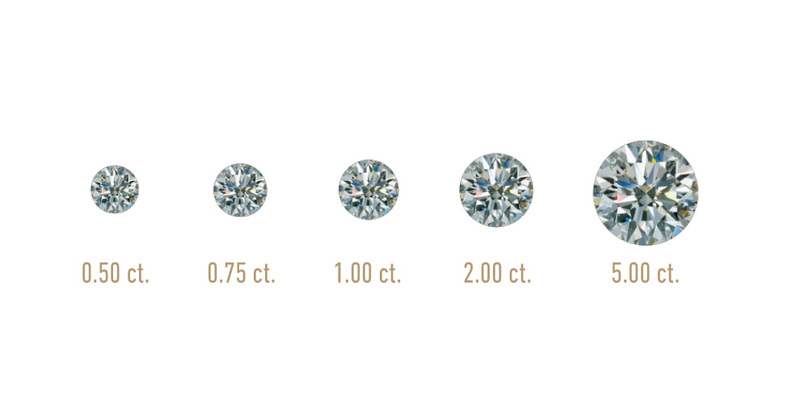 The quality of cut is crucial to the diamond’s final beauty and value. Of all the 4Cs, it is the most complex and technically difficult to assess. 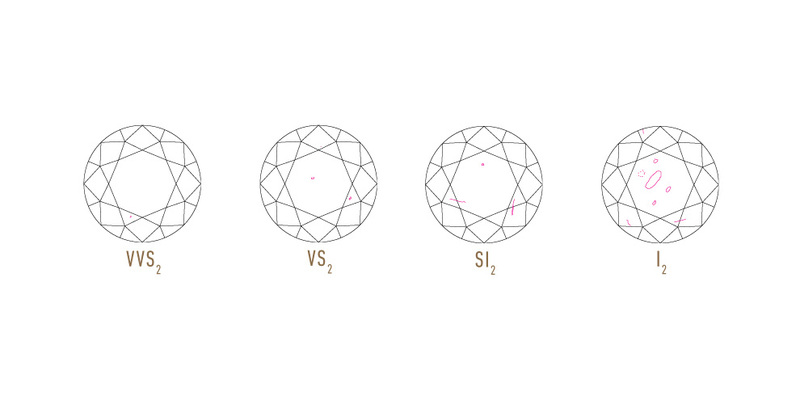 The GIA Cut Grading System for the standard round brilliant diamond evaluates seven components. The first three, brightness, fire and scintillation, consider the diamond’s overall face-up appearance. The remaining four, weight ratio, durability, polish and symmetry, assess a diamond’s design and craftsmanship. The design and craftsmanship of the diamond considers weight ratio (weight of the diamond relative to its diameter), the diamond’s girdle thickness (which affects its durability), the symmetry of its facet arrangement, and the quality of polish on those facets. 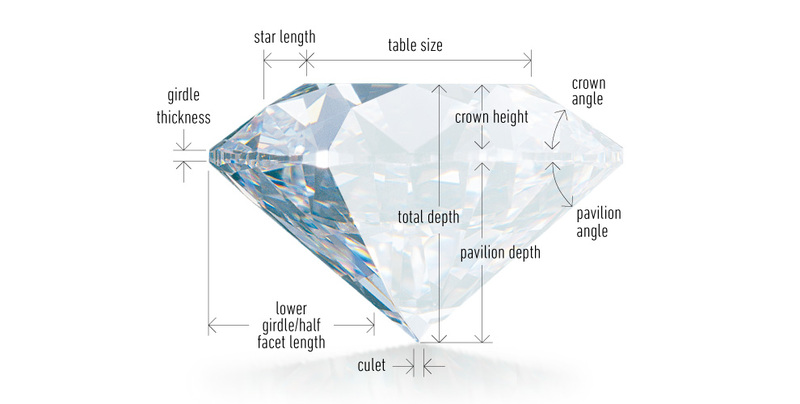 Cut is oftentimes confused with the shape of the diamond. The most common diamond shape used in jewelry is the standard round brilliant. All other diamond shapes are known as fancy shapes. Traditional fancy shapes include the marquise, pear, oval and emerald cuts. Princess cut, cushions, triangles and a variety of other are also gaining popularity in diamond jewelry. Excellent No polish defects visible at 10x magnification. Very Good Any defects are extremely difficult to see at 10x magnification. Good Any defects are difficult to see at 10x magnification. Fair Defects are noticeable at 10x magnification, and may be visible to the naked eye. Poor Defects are visible to the naked eye. Not offered by Kapriss World. Poor is the only polish grade that should be avoided regardless of the size or clarity of the diamond. For this reason, Kapriss World does not carry diamonds with a polish grade of Poor. Symmetry refers to how precisely the various facets of a diamond align and intersect. This can include extra or misshapen facets, off center culets and tables. A diamond with poor symmetry may misdirect light that travels into the diamond, sending it off at slightly wrong angles, and thereby reducing the diamond's brilliance. Often, a diamond cutter will purposefully allow a minor reduction in symmetry as a way of preventing a defect present in the rough stone from being retained as part of the finished diamond. Excellent No symmetry defects visible at 10x magnification. Symmetry is more important in diamonds of VVS2 Clarity and higher, since the very subtle defects produced by Fair or Poor symmetry (which can resemble pinpoint inclusions) would compromise the diamond's otherwise flawless appearance. Despite its modest impact on appearance, symmetry has a significant impact on price; a diamond with Excellent Symmetry and Polish may be priced 10%-15% higher than a diamond with Good Symmetry and Polish. 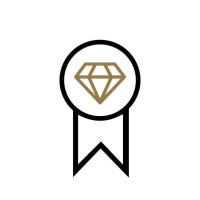 This premium has more to do with consumer's perceived value of "excellent" grades, than the actual effect on a diamond's appearance. Because diamonds with Poor symmetry have defects visible to the naked eye, these diamonds should be avoided in all cases. For this reason, Kapriss World does not carry diamonds with a symmetry grade of Poor. A diamond should not be chosen or rejected based solely on symmetry. Because the overall Cut grade already incorporates symmetry, it should be used as the primary determinant when choosing a diamond. When comparing two diamonds of equal Cut grade, symmetry (and polish) can then be used as a further refinement or tie breaker. Of the diamonds submitted to GIA over the past decade, approximately 25% to 35% exhibit some degree of fluorescence. However, only 10% of those show strengths of fluorescence that may affect appearance (i.e., strengths noted on laboratory reports as medium, strong, or very strong). In more than 95% of the diamonds that exhibit fluorescence, the color seen is blue. In rare instances, the reaction is yellow, white or another color. In recent years, diamond treatments, simulated diamonds, and laboratory-grown or synthetic diamonds have become more common, more advanced, and harder to detect. 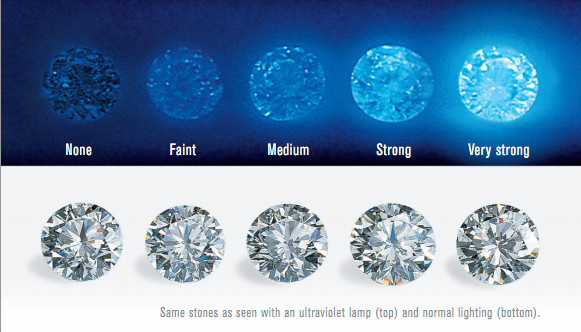 While treatments can change a stone’s color or apparent clarity, the presence of such treatments may affect the diamond’s value - particularly if the price reflects its appearance after treatment. A Diamonds Grading Report provides buyers with the ultimate assurance that they’re getting exactly what they pay for. Coating enhances a diamond’s color by masking an undesirable body color with an ultra-thin layer of chemicals or plastics. HPHT (High-pressure, high-temperature) process is an effective tool for changing the color of certain diamonds, making them colorless, pink, blue, green, yellowish green or yellow. Outside of a well-equipped grading laboratory, this form of treatment is virtually undetectable. Laser drilling is commonly used to remove small dark inclusions. The laser bores a small hole into the diamond’s interior and burns away the inclusion, or creates a channel through which a bleaching agent can be introduced to improve the inclusion’s appearance. Fracture filling hides white fractures in a diamond called “feather”. A glass-like substance is injected into the fracture to make it less visible and to improve the stone’s apparent clarity. Good fracture filling is very subtle, and so examination by a skilled diamond grader is necessary to detect its presence in a stone. A synthetic diamond is man-made, the result of a technological process, as opposed to the geological process that creates natural diamonds. Synthetic diamonds have essentially the same chemical composition, crystal structure, optical and physical properties of diamonds found in nature. Most synthetic diamonds are categorized as either HPHT (high-pressure, high-temperature) or CVD (chemical vapor deposition) diamonds, depending on the method of their production. 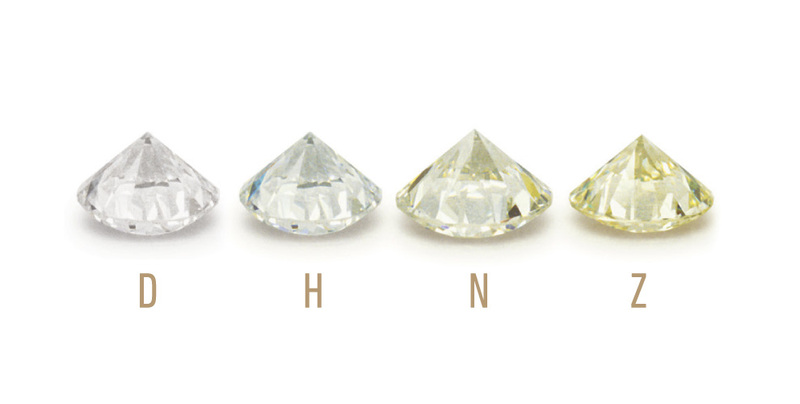 Since HPHT and CVD diamonds are virtually identical to natural diamonds, differences only become clear when they are viewed by a trained grader in a gem laboratory. The appearance of diamond simulants are similar to that of natural diamonds, but simulants are not diamonds. Common diamond simulants include glass and cubic zironia (CZ), both of which are completely unrelated to a diamond at the simulant’s atomic level. Tests and examines every diamond it grades for the presence of color and clarity treatments and to identify synthetics and simulants.